Robert Schwartz, Are Past Life Regressions Scientific? Robert Schwartz is a hypnotherapist who believes patients can discover their pre-life plan. … scientists tell us that the giant tsunami wave that devastated Southeast Asia in 2004 wasn’t as big as we usually imagine. It’s not that they got hit by a 20-foot-tall wave, as depicted here in the 2012 movie, The Impossible. It’s that they got crushed by a 20-foot wall of water that was miles and miles deep… and the human suffering that it brought is unimaginable… hundreds of thousands died… millions of lives were destroyed… and the devastation will go on for generations. Robert Schwartz: You’ll remember that a number of years ago there was a natural disaster in Southeast Asia, there was a typhoon and monsoon that killed about 100,000 people. I’ve asked about that event in the research I’ve done for planning Your Soul’s Gift and what I was told, in the channeling sessions, is that those 100,000 or so souls, before they were born, they looked at the earth and they said basically, “We would like the earth, as a planet, as a whole, to be in a certain frequency or vibration by a certain in linear time, and if it looks as if the earth is not going to get there, we agree to give our lives in a large scale natural disaster, because we know that the result of that disaster will be a worldwide outpouring of love and support and aid and compassion that will elevate the frequency of the entire plant. Alex Tsakiris: I think for a lot of people, including myself, that’s just an unsatisfying answer. Let me be clear, I don’t mean to be dismissive or condescending of today’s guest, Robert Schwartz. I believe he’s a true spiritual seeker and someone who dedicates his life to helping people and I don’t know if he’s right or wrong about the soul’s plan, raise the consciousness of the planet thing. I don’t know, but I want to know, at least, I want to investigate the best that I can. I want to have this level three discussion beyond the complete denial that consciousness exists and be on the Pollyanna, good-natured but misguided acceptance of every opinion on the matter. I want to get to level three. Intelligent, earnest, truth seekers like Rob, who are trying to figure out what all of this means. Stick around. 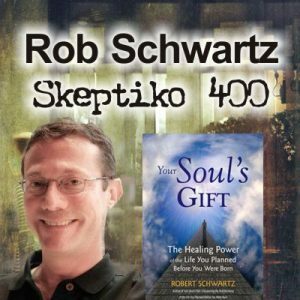 My interview with Robert Schwartz about what goes on between lives is coming up next on Skeptiko. Alex Tsakiris: Today we welcome Robert Schwartz to Skeptiko. Rob is a trained hypnotherapist who helps guide people through past life regressions. He’s also the author of two very popular books, Your Soul’s Plan: Discovering the Real Meaning of the Life You Planned and Your Soul’s Gift. Rob, welcome to Skeptiko, thanks for joining me. Robert Schwartz: Thank you Alex, it’s a pleasure to be here with you. "Are Past Life Regressions Scientific?" Most published research findings are false, so I would say, no. Past life regressions are not scientific. They are mostly true. Michael Newton is another expert in Life Between Life regression, he is the founder of the Newton Institute, teaching hypnotists how to do between life regressions. His students are all over the world, my state Ohio has one, though I had never visited her. This is why I would trust Robert Schwartz more than most scientists. He is not trying to fit his data to a preconceived idea of consistency, or prove a hypothesis, or support a theory. He is just making observations. "I'm not trying to resolve those discrepancies" might sound like he is not doing serious research, but it is actually a sign of a superior type of research. It means he is trying to be objective, he is not starting from a set of beliefs that will inject bias into his findings. Brian Weiss MD, renowned American psychiatrist and hypnotherapist who specializes in past life regression, also mentioned between life regressions in many of his books. What makes PLR unscientific would be the facilitator consciously or unconsciously leading the client. I recall a practitioner controlling for this and still getting good results. Apparently the clients awareness of the cultural features of the time frame they were in during the session matched historical accounts they would not have known. This happened with a large enough sample size to indicate they received the information through anomalous means - suggesting that the information did not come from the persons memories or their unconscious. Why would that not be considered scientific? Do you have a link for this? Re; Discrepancies in what is reported concerning reincarnation and other aspects of the afterlife that Alex asked about. First, I'm a big believer in the Bell Curve and its ramifications. Second, my research and experience causes me to dispense with the notion that upon passing out of this physical plane and into the next that one becomes enlightened and obtains perfect knowledge of everything. In fact, it appears to me that the deceased are little changed from who and how they were in life. If we accept that the evidence points toward people remaining as they were in life, then the disparate reports of what it is, how it all works, reincarnation yes and no become more understandable. Most people are incurious. For every forum like this there are 10s of thousands (probably 100s of thousands) where people expend their time and energy discussing and debating the most mundane of topics. Most people want a full belly, nice things to wear, a circle of friends and maybe a few people, like family, that care more deeply about them, a little recognition at work, enough money to cover the bills and entertainment. If life isn't working out, they turn to addictions and other carnal distractions to escape. Rarely do they ask the big questions, let alone derive reasonable answers. Lending confirmation to that is that in the spirit world it seems, from the available data, that most - especially the more recent arrivals - are in a place called "Summer Land"; which is a nice enough spirit equivalent of a full belly, nice things to wear, nice neighborhood, etc. Furthermore, my experience in life has been that people have no problem tossing out their opinion - even though it may be totally uninformed - as if it's fact. They just don't have intellectual integrity. They really don't care about truth and they want to sound as if they are "in the know". Add to pervasive incuriosity and lack of intellectual integrity that the majority, even among the 2 standard deviations or greater above the mean in intelligence or adventurousness, simply aren't good communicators, even when they truly understand the subject matter they are trying to describe. Again, we're going with the idea that passing out of the physical doesn't substantially change this characteristic. Then we have that problem that mediums are subject to these same issues. Bottom line is that encountering a spirit/medium combo that has asked the big questions, objectively explored, hypothesized, analyzed, tested and formulated an answer is going to be a very rare event. So we get a bunch of junk and half-baked, poorly communicated concepts. And that's before we factor in the tricksters, psychopaths/demonic deceivers. As below so it is above. I think there is ample evidence that suggests reincarnation does occur in some instances. We all know about Ian Stevenson and ongoing work at the University of Virginia. The James Leininger case appears pretty convincing and as do others. What we don't know is if hypnotic regression can get us there. Beyond issues with hypnotic suggestion, there is the problem of hypnosis inducing a state of mind similar to remote viewing wherein one is viewing the past and then assuming that the past that is viewed is a former life that one lived, as opposed to something lived by someone else. It is very challenging to assign meaning when we don't know the parameters of what is possible. Finally, the idea that we consciously plan out our next life with the help of spirit guides has always irked me for some reason. I can see the therapeutic value to those who have suffered the loss of a loved one (as Rob mentioned), but beyond that I just can't hang with any of it. I can't put my finger on exactly why it bothers me so. I guess I agree with what Alex said to Rob about how the true breadth and impact of the negativity effects people is down played. Sure, a tsunami, a murder, any tragic event might bring out some sympathy and good vibes from concerned people, but it also causes a lot of people to become bitter and question God, etc. People that have been abused as children often go on to have terrible lives and outlooks. Souls can become hardened and coarse if faced with evil more, often than achieving a higher understanding. These things have a ripple effect through history that is not measurable when ethnicities or nations are involved . Saying it's all for the greater good seems flippant to me. Maybe some people sort of kind of "plan" their next life based on karmic forces, but that's probably pseudo-voluntary and pseudo-consciously done. I would have to personally examine Rob's processes for eliciting and collating these reports before I began to seriously consider them. It is interesting that your interview (presumably backed up by discussions prior to the actual interview) seems to have reached him! Also, you seem to have improved your interviewing style - less of a harangue, more a process of letting a guest speak their mind a bit before interjecting. I think if you had interviewed Churchland that way, you could probably have really tied her in knots - it would have embarrassed her a whole lot more than the bust up did! Consciousness is just what we call certain patterns of information in the brain. Free will does not exist. Certain sorts of free will exist, but not libertarian free will. We have to settle on a definition of consciousness before we can discuss it. Consciousness is an emergent property, like sand dunes or the wetness of water. Consciousness could exist within a computer program. Panpsychism solves the whole problem. Consciousness isn't really a thing, it is just the result of a whole set of brain mechanisms kludged together by evolution. Different materialistic speakers juggle this set in a way that looks like a meaningful process, and if you really press them on one, they give way a bit for the duration of the interview, but really nothing changes. As for your question, although my first change of opinion was from being a Christian to being a materialist, by far the most interesting change was the second change to the position I hold now. If I am honest, I probably liked the church I went to as a teenager because there were some cute girls in its youth club! The second change took a lot longer. I remember being super excited that computer science was taking on the idea of Artificial Intelligence (AI), because it seemed obvious to me that the brain computed, so AI must be possible, and this was 1980, when computers were getting really powerful!! The crash of the AI dream back then, left a deep impression on me. Nobody much seemed to want to argue that the crash was because of a lack of computer power - so why exactly was it that so many research programs, backed up by absurd hype and tons of money, came to almost nothing? Since you could, in theory, simulate anything, including the brain, on a computer, how could it possibly be that a computer couldn't mimic the brain? To be clear, I didn't consider that there was a meaningful difference between AI and computer consciousness - I still don't. This remarkable failure made other ideas, such as ESP of various sorts, seem rather more plausible, and I gradually slid into my current position helped by discussions on the mind-energy forum, and of course Skeptiko. One big change came relatively recently, when Lone Shaman persuaded me that the theory of evolution by natural selection was a non-starter. Maybe I might reverse my view if I ever saw AI begin to work as the hype would suggest. I wouldn't be impressed by a car that could drive itself along a motorway (freeway) somewhere in Arizona, I would be impressed by one that could drive from one suburban location to another in a different city in all weather conditions that wouldn't stop a human, and with a few roadworks and broken down vehicles along the way. I haven't had enough personal psychic experiences to rely solely on that evidence. However, I really can't see myself needing to reverse my current position. Second, my research and experience causes me to dispense with the notion that upon passing out of this physical plane and into the next that one becomes enlightened and obtains perfect knowledge of everything. Are you referring to actual research that you are involved with - if so, do please tell us more - preferably in a new thread. Hi David, Nothing that exciting. Just reading everything available that appears to be done properly; from the researchers of 100+ years ago to current. Experience = sitting with a medium who was very good for a personal matter as well as with the same medium and a couple of relatives who communicated with different spirits than I did - and some experiences during OBEs. Thanks - I hope you were careful not to give too much information away to the medium. Since you are here, I guess you were careful., and going to a medium is a small piece of actual research! Alex, the first point I want to make came at the end and it’s that I think sometimes ‘maybe’ is the only description that works! Surely ‘I don’t know’ is better that a stab in the dark ‘sometimes’. This for me was a ‘I don’t know’ episode. I’m open to much of what Rob says, but feel content leaving it there. I’ve heard Rob before and others like filmmaker Rich Martini, who’s a fan of Dr. Michael Newton the well known hypnotherapist. If this is my destiny, then I’m relatively content with not messing with my plan. I think that if info that we get from mediums is useful, then it’s probably useful! I’ve been to see a medium, it was hopeless. Thinking about it, I wasn’t in desperate need of help or anything like that, I was just curious. Maybe that’s not enough? He offered me my money back too btw. My feeling is that doubt is better than certainty too. Doubt leaves space to breath, certainty stifles us. Rob says ‘we must be discerning’ about any info we get from mediums or adc’s etc. In a way I agree, but it’s difficult to do when you’re desperate to believe something. Bias is not a great fan of discernment. I wasn’t that excited, I was content. That’s at best a maybe for me. my research and experience causes me to dispense with the notion that upon passing out of this physical plane and into the next that one becomes enlightened and obtains perfect knowledge of everything. In fact, it appears to me that the deceased are little changed from who and how they were in life. If we accept that the evidence points toward people remaining as they were in life, then the disparate reports of what it is, how it all works, reincarnation yes and no become more understandable. great point. I definitely understand that interpretation of the data. Most people are incurious.... Lending confirmation to that is that in the spirit world it seems, from the available data, that most - especially the more recent arrivals - are in a place called "Summer Land"; which is a nice enough spirit equivalent of a full belly, nice things to wear, nice neighborhood, etc. wow... never thought of it in that way... it fits... maybe we get what we're ready for. They just don't have intellectual integrity. They really don't care about truth and they want to sound as if they are "in the know". ok, but maybe this the best we can do. And maybe to think otherwise is to lose sight of our dilemma. I mean, maybe it's a take is to say "well there's so much noise in the data were getting back from the spirit / medium combo, I wish you were as clean as the data we're getting back from the science / lab combo. As if! Siddhartha is saddened and ashamed but when Vasudeva suggests that the boy should be brought back to the town, Siddhartha is reluctant to part with him. He is worried that his son will succumb to the town’s pleasures. The ferryman smiles and tells Siddhartha to trust in the river. What can one do to save someone from the world, what can one teach him? He reminds Siddhartha that he himself ran from teaching and found awakening by the river, following his own path. He assures Siddhartha that all the love in the world will not save someone from their destiny. There’s also a lot of consistency reported amongst UFO abductees who undergo hypnosis with regards to simarties in their experiences. While it’s possible that there is some leading going on on the part of the therapist and/or some people undergoing hypnosis who have some knowledge regarding the phenotypical experiences of others abductees, after you scrutinize the testimony taken from these sessions, they do come across as more genuine and less made up (generally). Of course that’s a tricky thing to discern, so who’s to say for certain. But the consistency is striking, PARTICULARLY with regards to the amount of high strangeness reported. I think if a bunch of people where going to make up some abduction stories, they would make them up based upon our everyday experiences, which are devoid of high strangeness. Adding in all these bizarre details makes one seem less credible and believable. So, I have to believe that they are reporting them simply because it’s what they experienced. It’s an enormously small portion of the population who is in tune with the reality of high strangeness with regards to close encounters and abduction scenarios. Even many “top” researchers do not consider or talk about what appears to be the paranormal and bizarre aspect of the phenomenon. But yet it’s very widely reported. If I’m going to make up a story about being abducted and want people to believe me, it’s going to sound a lot like an e everyday Earth kidnapping, and less like a bizarre ghost story. Of course a lot could be said about what I’ve written and it could be analyzed a million different ways, and while I’m certain that regression is an imperfect practice, I also feel that it’s potenfially valuable. And I do feel that it works, GENERALLY. The skill of the therapist and the state of mind of the subject being the key variables. I’ve read one of Michael Newton’s books, and (more recently) I’ve paid a lot of attention to the reports of reknownded astral travelers. While there is pretty solid agreement between amongst these astral travelers I’ve been reading with regards to afterlife and in-between life states, I’m not sure how well it meshes with Michael Newton’s work. I was going to go into more detail here, but as of right now I need to leave my computer. If there is some interest here I will go into some more detail later on what I mean by this. Ha! Hesse is among my fav authors and Siddhartha my fav of his works. First read it in high school. I re-read it every four or five years and each time find that, since the last reading, my thoughts about it have changed a bit. The book has become like a mirror to me. To be clear, I'm not frustrated with the dirty data. I'm used to that professionally. Nor am I frustrated with the human foibles I mentioned (anymore...it used to drive me to drink when I was young and full of ideals and hyper-energy). Indeed, it's all part of this wonderful, mysterious bitter sweet thing called life. I still firmly believe it points to a clear trend and it certainly tells us that something is going on in the realm of consciousness and that we are not meat-bots. IMO, the data is absolutely convincing that we survive bodily death, that there is psi while we are still embodied, etc (I'm also convinced by the data that UFOs are sometimes real nuts and bolts craft from other solar systems). IMO, we do not have enough data and what we do have isn't collected properly. I think Julie Beischel's work is fantastic, but suffers from restrictions necessary to pass rigorous peer review. I understand why she did it the way she did. What people like us need to do (and it is a post-retirement project I'm contemplating) is build a data base that can handle a large number of variables that we think might be important, but also with room to expand to handle emerging variables. Gather mediums that have proven reliable, dispense with all of the double blind protocols and have séances with a large number of people who are contacting a wide variety of deceased spirits (or other entities). Have the sitters provide characteristics of the deceased as they knew them in life (pre-death variables) and then collect statements from the same people, now spirits, regarding our big picture questions and turn that into post-death variables in our DB. Run some regression analysis, cluster analysis (really just advanced multivariate regression) and observe that patterns that emerge. Refine our data collection and repeat.....this approach would probably never pass peer review let alone satisfy the skeptics, but it might help us gain a better understanding of why we get the kinds of answers from beyond that we do. It might present a clearer picture to us. I know what you mean, and I think if this subject wasn't so insanely controversial, science would have done something like you describe. Doing private research is never easy though, Alex wanted to reproduce Rupert Sheldrake's experiments with dogs that know when their owners are coming home, and he said he got some good results, but then that project seemed to disappear. I suspect the problem is that there is so much logistics - finding someone who owns a suitable dog and who is willing to disrupt their lives for the time needed to not only collect statistically meaningful results, but to start to explore the various variables - as you suggest. I wonder if those certified mediums can work from a simple email message. Since they are able to pass Beischel's test, presumably they would not be tempted to try to research the email to get personal details from it (I am not sure if this is possible). Alternatively, it is possible to create a HOTMAIL address which is anonymous and simply use that. Assuming the cost per consultation is not too high, this might be a good way to create your database. It would never pass the uber-sceptics, who take it for granted that people like us simply want to waste our time faking up research, but it might be a great way to explore this aspect of ψ. One nice feature of this would be that people like me, who are not really psychic could still get some direct evidence of the paranormal! I think a thread on that subject would be an excellent idea - when do you expect to be back?